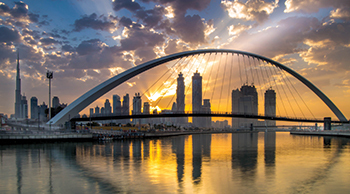 Dubai Water Canal ... a major success for Six Construct. Six Construct continues to gain strength in the region, buoyed by a legacy of landmark projects built over the past five decades. From Abu Dhabi’s iconic corniche development five decades ago, this subsidiary of the Belgian Besix Group counts among its achievements the Jumeirah Emirates Towers, Shaikh Zayed Grand Mosque, Emirates Palace, Burj Khalifa and Dubai Water Canal. 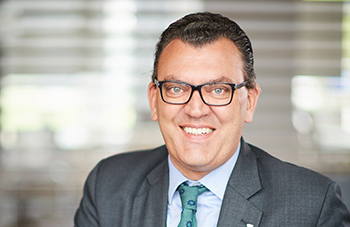 The company is this year celebrating its 53rd anniversary in the region since its first contract at the Abu Dhabi Corniche in 1965, Pierre Sironval, managing director of Six Construct, tells Gulf Construction. Sironval ... a promising future. Six Construct has undertaken construction, infrastructure and marine works contracts that have involved a high level of complexity, he adds. The company is currently working on a deep tunnel stormwater system for Dubai Municipality in a joint venture with Porr, which is a key project for the emirate’s infrastructure. “The objective of the project is to collect and convey groundwater and stormwater runoff from the Dubai World Central area (about 135 sq km) and adjacent communities (about 245 sq km) which will be discharged into the Gulf,” Sironval explains. Two earth pressure balanced tunnel boring machines (EPB TBMs) will excavate a 10-km-long tunnel at 30 to 45 m below ground with a boring diameter of 11.05 m – the biggest TBMs ever utilised in the UAE. “The Dubai Municipality has a strong vision for Dubai to be smart and sustainable, and the Deep Tunnel Storm Water System we are building provides the infrastructure needed to serve Dubai’s growing residential and business communities,” remarks Sironval. He says the drainage system of the tunnel needs to be strong enough to cope with increasing urbanisation, severe rainfall and a high groundwater level. This ground-breaking tunnel will tackle both rainwater and groundwater, and will drain almost 40 per cent of the entire urban area of Dubai including the flagship project Dubai South, with Al Maktoum International Airport, the Expo 2020 site and several other emerging developments. The deep stormwater tunnel in Dubai ... a key ongoing infrastructure project. “This 10-km tunnel will have four deep shafts (14 to 20 m in diameter and 40 to 45 m deep), to link the connection chambers with the tunnel. 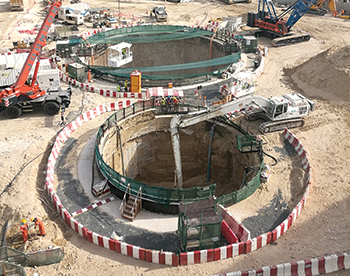 Four connection chambers (one at each drop shaft) will collect/connect water from the stormwater network to the shafts; and two micro-tunnels (3 m diameter/380-m-long each) will be built below Sheikh Mohammed bin Zayed Road. Minor mechanical, electrical and plumbing (MEP) works will be carried out such as Penstock valves, flow monitoring, etc. The project is on track for completion by 2020. The contract value is Dh1.3 billion ($353.9 million) with a construction period of 1,095 days,” he says. Among other major recent contract awards in Dubai, Six Construct has secured a build, operate and transfer (BOT) contract for one of the world’s largest thermal waste recycling plants in Dubai, in addition to an engineering, procurement and construction (EPC) contract for a seawater reverse osmosis (SWRO) plant in Jebel Ali. To further enhance its strength and capabilities in the market, its parent firm Besix has joined hands with the Sharjah Investment and Development Authority (Shurooq) to operate and maintain an existing wastewater treatment plant in the Al Saja’a area of Sharjah. The joint venture known as Qatra is developing and expanding Sharjah’s wastewater infrastructure in line with the emirate’s masterplan, while ensuring the highest level of operating excellence and service to all stakeholders. The expansion plans will also enable the plant to maximise the amount of reused water produced, thereby doubling the capacity of recycled water from 30 to 60 million litres per day, mainly for industrial use. Commenting on the recently completed Dubai Water Canal development, Sironval says the project’s main challenge was the diversion of the underground services to enable excavation and construction of the 3-km-long canal to proceed smoothly. “The Dubai Water Canal cuts through high-profile residential areas in Jumeirah, as well as some of the city’s main traffic arteries, and our teams went to great lengths to minimise the impact on the traffic and the local residents. “Rethinking old methods, the new deep sewerage system was built using the NDRC (non-destructive road crossings – directional drilling – micro-tunnelling) method, pushing concrete GRP (glass-reinforced plastic) pipes over distances of over 100 m, also limiting the impact on the surrounding traffic and neighbourhoods – a remarkable strategy, as this method is usually put into practice to cross a single road, highway or railway,” says Sironval. Six Construct is active throughout the GCC, and has recently been working in Bahrain on a liquefied natural gas (LNG) project. Bahrain LNG is a receiving and re-gasification terminal in Bahrain, and forms a vital part of the country’s energy infrastructure. The LNG terminal’s scope of works includes design and construction of an LNG jetty constructed on drilled and grouted pin piles with a maximum length of 55 m, located 5 km offshore (with a seabed level at -18 m); and a 600-m-long rubble mound offshore breakwater with concrete armour units, of Accropodes II type. Six Construct is also active in Oman on the Duqm liquid bulk berths project. Slated for completion in October 2019, the EPC (engineering, procurement and construction) contract for the Special Economic Zone Authority Duqm (Sezad) includes the design, procurement and construction of all permanent dredging, reclamation and associated ground improvements; permanent revetments and scour protection; all continuous quay berths including associated quay furniture; all double berth island jetty structures; infrastructure required for the oil spill response equipment; and various seawater intakes and outfalls. Six Construct is the largest Belgian construction company operating in the Middle East. The multi-services company undertakes construction of commercial and residential buildings, sports and leisure facilities, infrastructure and marine-related projects. The company currently employs a workforce of 12,000 in the Middle East, and a total of 15,000 worldwide. In 2017, it recorded a turnover of over Dh2.4 billion ($653.5 million). Commenting on the overall business environment in the region, Sironval says it will improve as oil prices in the Middle East recover slowly to pre-2016 times. Additionally, Saudi Arabia’s new public-private partnership law in the making will open up the national economy for privatisation of its infrastructure assets. The GCC region is also shifting from a dependence on oil revenues, diversifying into alternative sources of revenues such as entertainment and leisure mega projects, and boosting the role of the private sector, says Sironval.